ALL COMBINED ON A GARLIC HERO. Is your mouth watering yet? This is just one of the many sandwiches that are sold at Anthony & Son Panini Shoppe. Anthony and Son Panini Shoppe is located in East Williamsburg, where there is a variety of trendy and hip eateries; a prime location for these sandwiches. @paninishoppe currently has 75,000 followers on Instagram. They post a variety of their mouth-watering sandwiches and people go crazy for it. I mean come on, who wouldn’t? Over the years, the shop has gained many devoted customers through family and friends and local neighbors. Every day you get to see familiar faces, longtime friends that have been going to the shop for years that speak so highly about not only the food but the friendly environment. One customer has been going to the shop since he was seven years old, and basically grew up buying things from the deli with his parents. When he was older, he began working at the shop and soon became the manager. Years later, even after leaving the shop to focus on his career, he still comes back every day for coffee. Along with the familiar faces, every day you also meet new people who have seen a picture on Instagram and travelled to get their hands on one of the sandwiches. “I had seen such amazing food pics on this place on Instagram and today I finally tried it out and I was not disappointed! 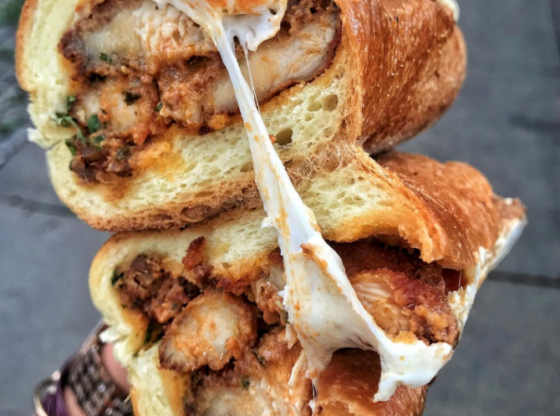 I tried the Matt and Steve 2.0 it had such wonderful flavor the bacon was nice and thick and delicious, and the chicken cutlet was delicious as well as the mozzarella sticks American cheese and vodka sauce on it!” said Joey L. on a yelp review that he posted about the shop. Many people have travelled from near and far just to get their hands on the many different and amazing sandwiches. People have come from Washington D.C., Connecticut, and even California to try a sandwich from Anthony & Son Panini Shoppe and have left a full stomach and an enjoyable experience. Famous rappers and singers such as Dave East, Joey Badass, 50 Cent, Lloyd Banks, and Kehlani are among the list of people who have indulged in one of their amazing sandwiches. Originally named Anthony Fruit & Deli in 1994, where the store was more generalized in the products they sold. Thirteen years later, they decided it was best to focus on creating unique and creative sandwiches that people would love. Currently, the shop offers a wide variety of twenty five signature panini’s and thirty signature heroes and it’s safe to say that they offer something for everyone. The sandwiches range from cold cut panini’s to hot sandwiches and everything in between. Let’s not forget to mention their lettuce wraps and salads for those of us who want to cut down on the carbs. Their secret ingredient is to provide customers with the freshest ingredients possible, starting with their homemade fresh mozzarella, that the owner Antonio Curcio, makes every morning. One bite of that fresh mozzarella and you are able to taste the same mozzarella that is in Italy. Anthony & Son has been in the heart of Williamsburg for twenty-four years and still to this day remains as a location that brings people together all for the love of great quality food. As the years have passed, the shop has become one of Brooklyn’s Favorite Sandwich Spots and is continuing to grow each and every day.